Our new students for Fall 2014 arrived in Windhoek, Namibia on Wednesday afternoon. 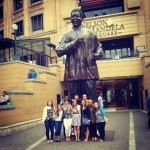 The students arrived in Johannesburg, South Africa, on 17 August, and spent ten days learning about the history of South Africa and their struggle for liberation. The students got the opportunity to talk to various organizations and hear from many different viewpoints. One of the highlights that many of the students mentioned was the opportunity to meet many influential speakers and be able to engage with them in a small group setting. The students were shocked to learn about the vast inequality that exists in South Africa. Many found it hard to believe that one of the poorest townships was in the same municipality as Sandton, one of the wealthiest areas in Johannesburg. Many of the students mentioned that reading about these inequalities in a textbook could never do the reality justice and they were very grateful to get the opportunity to see these inequalities first hand. The students also got to meet with members of the African National Congress (ANC), the ruling party of South Africa, and the Democratic Alliance (DA), the official opposition. The students got to hear each parties platform and where they would like to see the future of South Africa. Another highlight for many of our students was their home stay in Soweto over the weekend. Soweto stands for South West Townships and is an area made up of 34 townships and is a suburb of Johannesburg. Our students were split up into pairs and were placed with one of five families throughout Soweto. Some of our students got to attend a soccer match, go to church with their families, or just hear about daily life in Soweto. The students were all very grateful to get to spend time with families in Soweto and to look at the similarities and differences between Soweto and their communities in the United States. After finishing their time in South Africa, the students took a quick flight up to Windhoek and spent their first day meeting all the staff and getting a tour of the house.